Exclusive! BERNINA Stitch Regulator (BSR) The BSR is designed to assist you in mastering free-motion techniques by keeping stitches consistent at variable sewing speeds. The BSR offers confidence for the beginner and additional assurance for the experienced quilter. Standard with the B 880 PLUS, the BSR provides high-speed free-motion stitching assistance with both straight and zigzag stitch options. Extended Freearm The B 880 includes a meticulously engineered extended freearm area with a full 12 inches of space to the right of the needle and five inches in height. With this extra-large area, you have the added benefit of a jumbo embroidery field, an extended space to expand your creativity. Exclusive! Jumbo Bobbin The unique jumbo bobbin featured on the B 880 PLUS offers up to 70% more thread capacity and pops in and out at the touch of a finger. That means fewer interruptions, fewer stops to wind your bobbin and a lot more time to set your imagination free. Exclusive! BERNINA Dual Feed Optimum visibility. Superb maneuverability. The innovative BERNINA Dual Feed tames hard-to-manage fabrics. It’s easy to engage when needed and tucks completely out of the way when it’s not. Fully Automatic Features Imagine a machine that automatically responds to your needs. The presser foot automatically lowers at the start of a seam and lifts again at the end. The B 880 PLUS will even cut the thread for you at the end of a seam or color change in embroidery. The feed dog raises and lowers automatically for free-motion stitching and embroidery. And of course, fully automatic threading is yours at the touch of a button. Extensive Stitch and Design Library The BERNINA 880 PLUS includes a library of over 1,764 stitches, conveniently stored by category for a wide variety of applications. You’ll find the perfect stitch for every sewing project. Over 460 high-quality embroidery designs, including motifs by well-known designers, and 12 font styles that are perfect for personalizing your projects. Exclusive! Total Stitch Control The B 880 PLUS provides an exclusive level of stitch control. 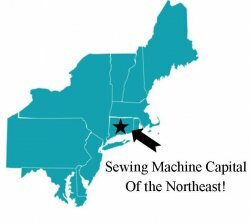 Whether altering the stitch length, stitch width or needle positions, or even creating custom combinations with drag and drop functionality, you’ll appreciate the convenience of a machine that remembers the stitch details for you. Endless Embroidery Options The B 880 PLUS offers even more features and options for embroidery lovers. Design editing allows you to easily position, mirror, rotate, combine and resize motifs. You can create curved lettering effects, alter stitch density, and combine alphabets with embroidery or create beautiful, endless embroidery designs. Complex combinations can even be resequenced according to color, and alternative color options can be reviewed with the help of the Color Wheel before stitching out. The finished design can be saved directly on the machine or a USB stick. What’s more, additional designs can be imported to the machine via the USB port. And the Check function lets you position the design precisely before embroidering. Easy stitch selection The B 880 PLUS touch screen gives you access to all stitch patterns and sewing stitches plus characters, for a total of over 1,700 imaginative stitches. Form changing The Embroidery Shaping function of the B 880 PLUS offers the option of duplicating embroidery designs with one click and then arranging them in a desired formation. Whether in a circle, square or heart, new and unique designs emerge. Embroidery module with extra-large embroidery area (400×260mm) BERNINA 880 PLUS Customizable embroidery designs With over 460 built-in designs and alphabets, embroidery is just a click away. Also, your own motifs can be quickly loaded onto the machine via two USB ports. With the addition of the Color Wheel, designs can be changed easily and coordinated to your favorite color scheme before you start embroidering. This makes it easy to choose the most beautiful colors for your embroidery project. Create original stitches with the New Stitch Designer The BERNINA 880 PLUS offers hundreds of stitches that are clearly categorized and easily retrieved. With the innovative Stitch Designer you can edit these or create your own stitches. Simply draw your ideas directly on the screen. The B 880 PLUS converts the design with a click into a stitch pattern. You can also change and save existing stitches. The possibilities are endless and your stitch library is continually expanding. The Modern Color Touch Screen The seven-inch touch screen on the B 880 PLUS offers highresolution images and brilliant colors. Cutting-edge touch screen technology lets you choose from a wealth of innovative functions. The B 880 PLUS offers drag and drop, vertical scrolling and the swipe function for deleting motifs easily. It also features a highly intuitive onscreen operating concept providing numerous personalized settings. 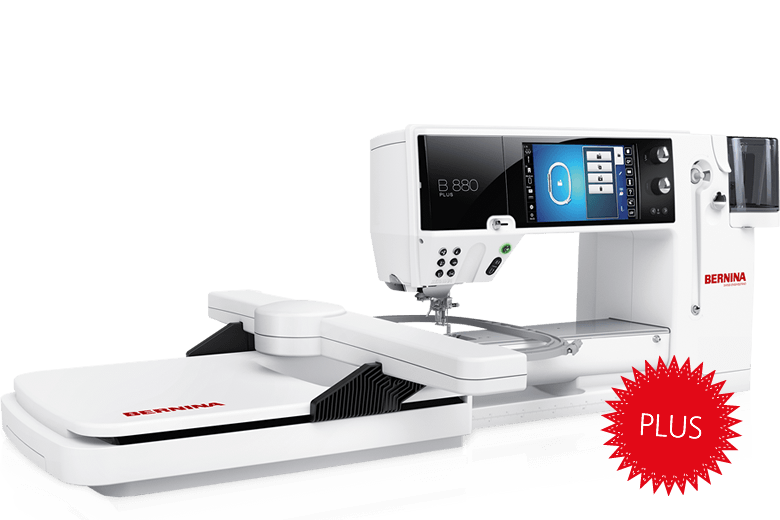 BERNINA Dual Feed with integrated balance function Automatic threading system Help, tips & tricks There are many tools built into the B 880 PLUS to assist you with your sewing and embroidery. The sewing advisor, a creative and embroidery consultant, offers on-screen support in selecting the appropriate stitch, the right needle, and making the necessary adjustments for the desired sewing and embroidery application. Tutorials demonstrate important steps. Whether you want to thread, thread the bobbin, or activate the BERNINA Dual Feed, simple animated instructions will show you how to proceed. Innovation The most space. The most speed. The most precision. The B 880 PLUS boasts many cutting-edge features developed by a team of experts in Switzerland. The B 880 Plus is state-of-the art technology combined with Swiss craftsmanship. The unprecedented functions and innovative features are designed with the sewist, quilter and embroiderer in mind. For example, the B 880 PLUS has a programmable foot control that provides the option to knot and cut the threads and as well as raise the presser foot in one operation tailored to each individual.